"I nearly called this post “Passover Carnival,” but was afraid you’d get the wrong idea. The wrong idea is a spree with lice races, chocolate matzah painting, origami frogs, and crafts.I’ve programmed all of those things at events (and they were fabulous), but this year I wanted something entirely different. No fluff. No games. No — gasp — no crafts! I wanted REAL and basic to the core, to the essence of a seder and of the whole holiday. And, it had to be FUN. Last Sunday, our school held a Walk Through the Seder Steps program for preK through high school. We called it our “Grater Seder” because kids would grate their own maror and charoset, and because we hoped it would be Great. It was. 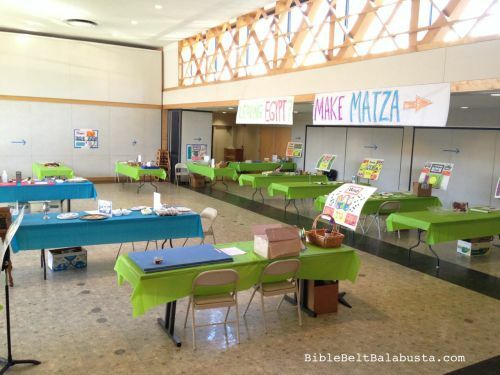 The Goal: to create hands-on, meaningful connections to the seder by walking through each step and completing a relevant activity. Each step is a station: a table staffed by a volunteer and set with at least one hands-on thing that invites participation so students experience highlights of that section."